Running behind and no time for a sit-down meal? Sir, I beg of you, put down that Pop Tart! You deserve a protein-packed start to your morning, but I do understand that you’re pressed for time. That’s why I’m setting you up with this highly convenient breakfast sandwich maker that’s sure to keep you well-fed, but still punctual. It’s got that all-in-one thing going on, so all you have to do is throw in your (pre-cooked) meat, your eggs, and your bread, press the little button, and walk away. It’ll be prepared and ready to go by the time you get your shoes tied, and it’s more cost-effective (and healthful) than hitting up that fast food drive-thru every single morning. 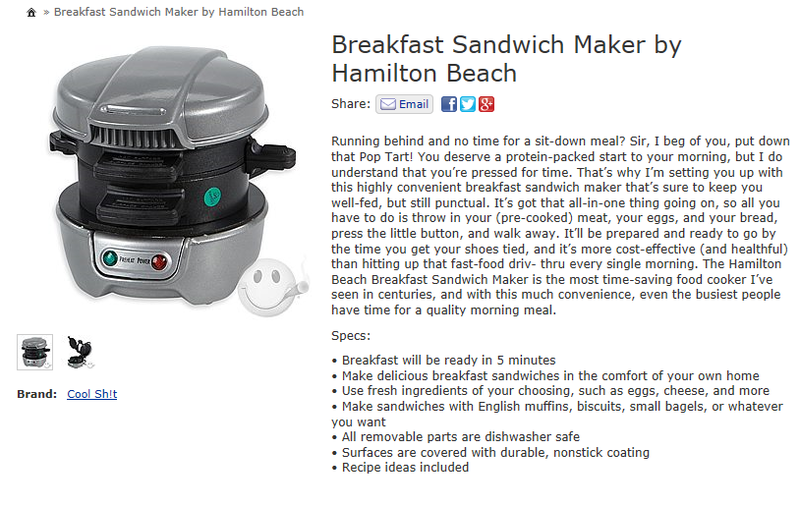 The Hamilton Beach Breakfast Sandwich Maker is the most time-saving food cooker I’ve seen in centuries, and with this much convenience, even the busiest people have time for a quality morning meal.